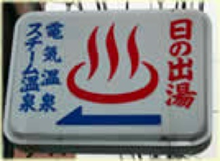 This sign ♨ means the bath or bathing facilities, and it helps you search sento. You can distinguish the bath for men or women by looking at noren. It shows the words “男 (for men)” and “女 (for women)” or the colors like blue (for men) and pink (for women). The fee of sento differs depending on a region in Japan, for example, 450 yen in Tokyo, 410 yen in Osaka, 280 yen in Saga. Kyoto (especially Kyoto City) has more number of sento compared with other prefectures. The fuel was wood in the past. However, it is heavy oil or gas now. The paint art with Mt. Fuji is the symbol of sento culture. In fact, not a few people recall the paint art with Mt. Fuji when they think about sento. It is said that the origin of it was Kikai-yu (located in Kandaenrakucho, Tokyo). In 1912, the owner of the sento asked a painter, Koshiro Kawagoe, to paint the wall of his sento. This became popular among the people, and other sentos imitated it one after another. One good idea of sento owner has led to the traditional paint art of Mt. Fuji. 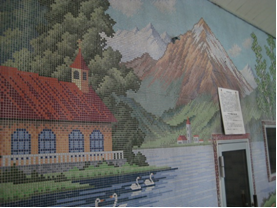 The tile art is the large-sized tile mural which is painted luxuriously and baked beautifully. Most of the tile art is made by the pottery “鈴栄堂 (Rin-eido)” which is famous for traditional Kutaniyaki , the porcelain made in the south of Ishikawa Prefecture. Most designs are happy and splendid such as “宝船 (takarabune),” treasure ship carrying “七福神 (shichifukujin),” the seven gods of good fortune. And some tile art has the exquisiteness as well as artistic crafts. The features making you feel comfortable in sento are large bathtub, vast space, clean water and so on. There are a lot of negative ions in the water and air of good quality. And when you take a bath in large bathtub at leisure, some alpha waves are generated in your brain and you feel very relaxed. 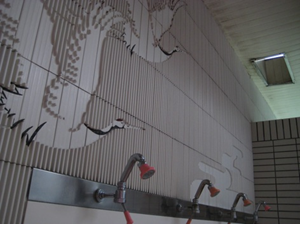 In this way, sento is popular among people as a more relaxing place than private bath. In general, the situation of sento business has been very difficult lately. There are two reasons for this. First, home bath has spread widely, and the number of customers who come to sento has been decreasing. Second, it is difficult to find and train a successor and many sento owners are aging. Because of these problems, many sentos have closed down. And the number of sento has also been decreasing according to the table above.